Reference number for this case: 30-Sep-54-Lantéfontaine-les-Baroches. Thank you for including this reference number in any correspondence with me regarding this case. 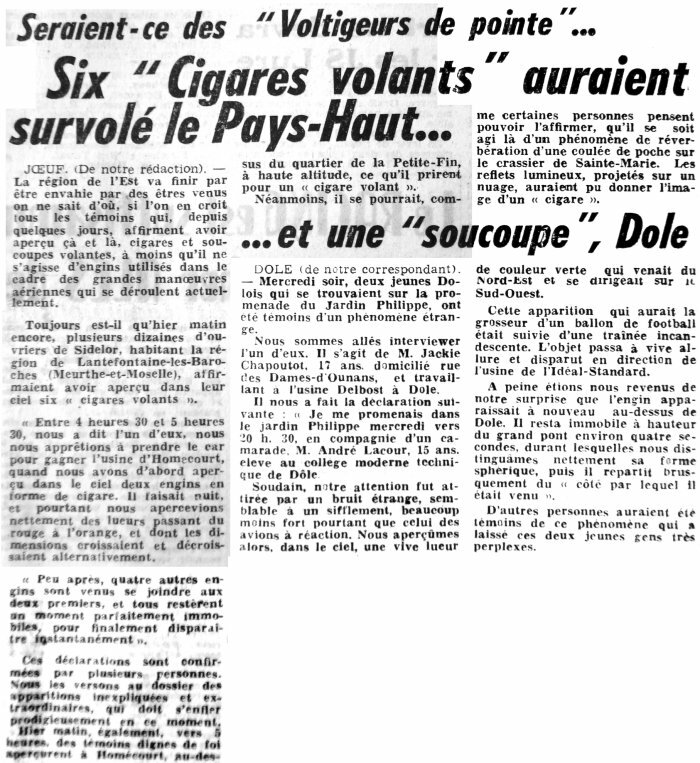 Several tens of workmen of Sidélor living the area of Lantéfontaine-les-Baroches (the Meurthe et Moselle), claim to have seen in the sky six flying cigars between 4:30 and 5:30. La Rochelle. -– At La Charron – (the Charente Maritime), three fishermen and a a customs observer state to have seen, during one of these last nights, a formation of flying saucers moving very low and flying over the shore, before disappearing. Aimé Michel says this case in Lantéfontaine-les-Baroches en Meurthe-et-Moselle occurred on September 23, 1954. Jacques Vallée indicates that for the day of September 24, 1954, the French Press mentioned a number of sightings, including one in Lantéfontaine in the Meurthe-et-Moselle, of a "single phenomenon". Indicating newspaper cuttings and personal files as their sources, the authors report of an observation on September 23, 1954 in Lantéfontaine-les-Baroches in the Meurthe-et-Moselle, of which they say that it is one of the rare observations in the world involving a formation of "cigars." At four o'clock and a half, in the night, on the roads which converge towards the SIDELOR factories, tens of workmen went to their work on bicycles. They see two luminous objects in the shape of cigars appear in the sky, which immobilize above the countryside. The majority of the observers put feet at ground for better observing the machines which do not move. Soon, under the eyes of all these observers, four other cigars emerge, sink in the direction of the two first and stop dead short while arriving near them. One of the witnesses indicates, "with one notable feeling of relief, we saw them start moving, rising, and disappearing in a few seconds." He and much of his comrades checked in with a few minutes of delay at the factory. The author indicates that on September 24, 1954, there were 9 sightings, 6 being on the Bayonne - Vichy line, one of those sighting was at Lantefontaine. The Belgian ufologist indicates that in 1954, on September 23, in France, in Lantéfontaines les Baroches (the Meurthe and Moselle), "It is 4:30. On the roads which converge towards the SIDELOR factories tens of workmen return to work by bicycle. In the sky they see two luminous objects in the shape of cigars emerging, which are immobilized above the countryside. The majority put foot at ground for better observing. The two machines do not move. But soon, four other cigars emerge. They dive in the direction of the first two and stop short while arriving in the vicinity. During a few minutes the six cigars remain motionless. They finally moved, rose and disappeared in a few seconds." The source is indicated as "GARREAU and LAVIER: 'Face aux extra-terrestres' - DELARGE 1975 - J'ai Lu, p. 258, 259". Luc Chastan indicates that in Meurthe et Moselle in Lantéfontaine on September 24, 1954 at an unknown hour there was an "Observation of a luminous object." Luc Chastan notes that the source is "M.O.C. by Michel Aimé ** Arthaud 1958". The website indicates that on 24 September 1954 at 04:30 between Lantefontaine and Nancy, Lantefontaine, France, "Hovered." And: "Hovering objects were observed. Six objects were observed by seven witnesses for over 60 minutes." The sources are indicated as Michel, Aime, Flying Saucers and the Straight-Line Mystery, S. G. Phillips, New York, 1958; Vallee, Jacques, Computerized Catalog (N = 3073); Vallee, Jacques, Challenge to Science: The UFO Enigma, Henry Regnery, Chicago, 1966. Not looked for yet. Possible military maneuvers. [af1] Agence France Presse (AFP) press release, France, September 25, 1954. [---] Article in the regional newspaper Les Dernières Nouvelles d'Alsace, Strasbourg, France, September 25, 1954. [---] Article in the regional newspaper Le Berry Républicain, Bourges, France, September 25, 1954. [---] Article in the regional newspaper Le Lorrain, Nancy, France, September 25, 1954. [---] Article in the national newspaper France-Dimanche, Paris, France, October 3, 1954. [gl1] "Face Aux Extra-Terrestres", book by Charles Garreau et Raymond Lavier, Jean-Pierre Delarge publisher, France, page 258, 1975. 1.0 Patrick Gross January 28, 2010 Conversion from HTML to XHTML Strict. First formal version. Additions [vm1], [go1], [lc1]. 1.1 Patrick Gross February 10, 2010 Addition [jc1], [ud1]. 1.2 Patrick Gross June 1, 2010 Addition [le1]. Addition of explanation "Possible military maneuvers." 1.3 Patrick Gross February 6, 2017 Addition [ub1].